The two wheeler division of Mahindra now has officially revealed the powerful 125cc version of its Gusto scooter. The Gusto has managed to capture significant amount of Mahindra Two Wheelers’ market share. 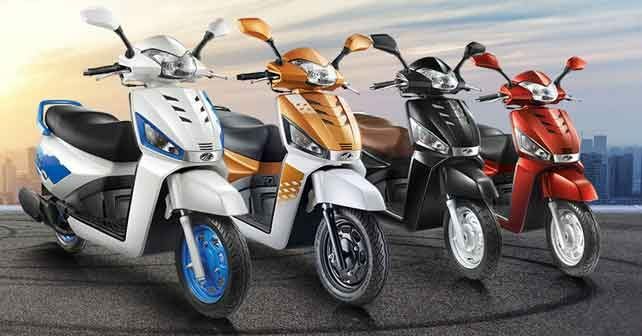 The company has said that Gusto 125 will be launched soon after the 2016 Auto Expo. The Gusto 125 units would reach showrooms/ dealerships by the end of February month. Under the hood, the all new Gusto 125 is powered by same 124.6cc, single cylinder, air cooled, four stroke petrol engine which is present in Mahindra Duro DZ and Rodeo UZO scooters. Gusto 125 can develop 8.48 bhp of power and 10Nm of torque. The power is transmitted to rear wheels of the Gusto 125 via a variable roller track CVT automatic gearbox. New Mahindra Gusto 125 gets 12 inch tubeless tyres and is equipped by 130mm drum brakes at the front as well as at the rear. Currently, Mahindra Gusto 110 is priced in the range of Rs. 44,850 to Rs. 48,850, (ex-showroom Delhi). The 125cc Gusto will definitely be getting a premium price tag, obviously because of more powerful engine. Just like the 110cc model, Mahindra Gusto 125 shall boast of features like remote flip key, front kick start, height adjustable seat, follow me home head lamp along with LED pilot lamps. Mahindra has now slightly altered the styling of the 125cc Gusto from the 110cc model to set it apart visually. You can now notice new front centre panel with vents designed. The powerful Mahindra Gusto 125 will be available in choice of four colours.